Cape Town – The extraordinary debut success of Faf du Plessis may just have turned the Test series between Australia and South Africa dramatically on its head. A little like JP Duminy’s unscheduled entry to the fray in the last series Down Under proved pivotal to the historic outcome, the Titans customer’s match-saving century at Adelaide Oval on Monday has given the Proteas an opening to cash in on likely Aussie mental and physical fatigue for the decisive final Test in Perth from Friday. The irony, of course, is that Duminy seized his opportunity with both hands in 2008/09 after injury struck down Ashwell Prince, and here it is Duminy’s misfortune that was instrumental in giving the 28-year-old Du Plessis his belated first chance in the Test arena. There is a short turnaround to the WACA, and the tourists have a rare – for the series thus far – and timely sniff of blood considering that they have been on the back foot for the bulk of the first two contests yet still managed to maintain all-square status. 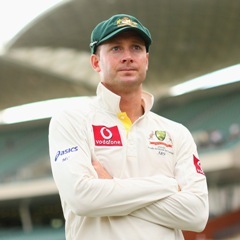 The Baggy Greens’ captain, Michael Clarke, while maintaining his customary cheery countenance, just about admitted in the post-match television interview at hot Adelaide that the spirited South African rearguard would have taken a toll on his team. Quite clearly first prize for the Proteas on Friday will be to try to win the toss (it is 1-1 on that score in the series) and take first strike, forcing the footsore likes of Peter Siddle, Ben Hilfenhaus and Nathan Lyon – assuming all three play, as they probably will -- straight into the field again. The admirably persevering Siddle was out on his feet by the end of the tourists’ successful defiance on Monday. He bowled 64 overs beneath the unsympathetic South Australian sun in this Test, which is a formidable tally for a quickie, Hilfenhaus got through 54, and the off-spinner Lyon will also not be the freshest fellow on the planet after as many as 94. In total, Australia bowled 272 overs in the Test to South Africa’s 177, and it is a weird thought that they have effectively been “punished” for batting so swiftly and commandingly in their first knock. It would be educative, incidentally, to learn when last a Test bowler – as Lyon did – sent down 50 overs in a single innings at a cost of fractionally less than one run per over (0.98). But that was also an indication of just how doggedly the Proteas clung on against the odds despite leaking as many as four wickets on day four. “He hasn’t wavered all day,” was the tribute to man-of-the-match and unbeaten century-maker Du Plessis from former national captain Kepler Wessels as his near eight-hour vigil came close to its safe completion. And when incumbent skipper Graeme Smith brands your innings “immense”, you also know it is coming from someone to whom that description has often before been given. Of course the draw would also not have been possible without the critical support Du Plessis received from his friend AB de Villiers and that peerless, injury-hampered character known as Jacques Kallis. Just a further fillip for the Proteas, looking ahead to the decider – and remember that Australia have to win to knock South Africa off No 1 spot – was De Villiers negotiating so much personal time at the crease. Usually an innings of 33 from him would not last particularly long, but remarkably he faced all of 220 balls which in many other circumstances would have taken him well, well past the century mark. So the hitherto labouring batsman/wicketkeeper ought to take heart from his effort and expect to experience greater freedom in stroke-play on the fast WACA surface where the ball hits the bat quicker but can also be thumped faster and further as a result. Collectively, the Proteas will have their tails up in a big way after having the kitchen sink thrown at them by a dominant Australian side at Brisbane and Adelaide, yet resisting the impact of it each time and living to fight another day. But they will also know that they are overdue to play much closer to potential in the Western Australian capital, especially with regard to bowling consistencies. The South Africans have not played like the top-ranked side in the world on this tour yet, and it will be a disappointment, frankly, if they have to use a get-out-of-jail card again to ensure even honours in the final fixture and cling to the mace in that way. They must strike for the win. There are many selection issues to discuss ahead of the WACA Test, with player fitness situations obviously a key element. But South Africa have at least demonstrated their pedigree in terms of fighting spirit, and you just begin to wonder whether the balance is shifting their way at a perfect time. I know which dressing room would have been buzzing more on Monday evening in Adelaide. The other would have been examining blisters.